“Härzlig Willkomme!” That’s how Rudolf Bernhard – founder of the Bernhard Theatre, and the Bernhard Bar Cafe’s namesake – would greet guests in his unmistakable Basel Swiss German dialect. It is our goal to make you feel just as welcome today. Dolce far niente is best enjoyed in our cozy cafe or on the adjoining terrace, which features views of the lively Sechseläutenplatz and of the brilliant radiance of the Opernhaus. 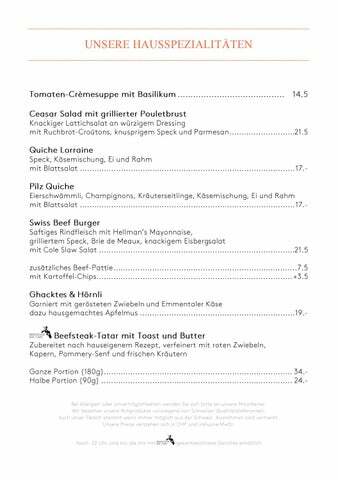 The Bernhard Bar Cafe is open on Tuesday to Sunday from 11:00 to 24:00. BERNHARD AT THE LAKE. BERNHARD ON THE SECHSELÄUTEN SQUARE. BERNHARD TO GO. The Bernhard Bar Cafe is known for its delicious, uncomplicated cuisine. Be it Flammkuchen or pizza (both served straight from the oven), the city’s best (and best-known) beefsteak tartar, fresh salads, warm soups, or homemade sweets – no matter what makes its way to your table, we guarantee it will delight your palate. The best way to reach the Bernhard Bar Cafe is via public transport: Tram No. 2 or 4 to the «Opernhaus» stop, tram No. 8, 11, or 15 to the «Stadelhofen» stop, or tram No. 5 or 9 to the «Bellevue» stop. From Zurich’s main station, take the S-Bahn to the Stadelhofen station. Cars can be parked in the Opéra park garage directly adjacent to the Opernhaus Zürich. From there, take the connecting passageway to the Opernhaus box office. The elevator located in the box office takes you directly to the Belcanto Restaurant. Rudolf Bernhard was born in Basel in 1901. He first studied to be an optician, but soon felt himself called to the theater. He got his first acting chops with the Dramatischer Verein in Basel, and later worked with the legendary Karl Valentin in Munich. Rudolf Bernhard appeared more frequently in Zurich starting at the end of the 1920s, especially at the Corso Theater’s Cabaret Mascotte. He specialized in farces and simple theater pieces (called Schwänken), and Zurich audiences soon fell in love with the big-toothed actor. On December 19, 1941, in the middle of the Second World War, he opened his own Bernhard Theater in the Café Esplanade. He often played the leading role in the theater’s performances. Unlike the rest of his castmates – who spoke their roles in High German – Bernhard spoke his text in his unmistakable Basel Swiss German dialect, winning the hearts of the Swiss audience. The country’s most famous artists – among them Emil Hegetschweiler, Schaggi Streuli, Fredy Scheim, Alfred Rasser, Leopold Biberti, Heinrich Gretler, Walter Roderer, Zarli Carigiet, and Peter W. Staub – performed at the Bernhard Theater. Maria Schell made her debut here, and Hans Moser and Heinz Rühmann both appeared in guest roles.